Truly Artistic.. Proudly Autistic. The tag line used by ASP to promote and emphasize the artistic talents of persons with autism. The tag line also serves as the title of several painting exhibits of ASP artists with autism like Andrei Macapagal, Vico Cham, Kenrick Cheng and others. The painting contest has been a major activity of ASP’s National Autism Consciousness Week celebration for the past five years. The activity proves as an avenue to identify and develop the artistic potential of children with autism (CWA). 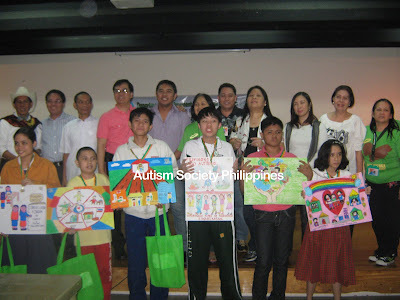 Winning entries of the contest are selected, framed and exhibited during the World Autism Awareness Day and other celebrations of ASP. Aspiring contestants can register at the ASP office at telephone number 929 8447 or 926 6941 and are requested to bring their own art materials and a ¼ size illustration board. The Social Hall of DENR Central Office in Visayas Avenue, Quezon City is the venue of the painting contest on Jan 23, 2012, Monday at 8AM. The contest is sponsored by the Department of Environment and Natural Resources, Committee on Social Services, House of Representatives, Department of Education, Department of Interior and Local Government, National Council on Disability Affairs, Philippine Academy of Rehabilitation Medicine and ASP National Office.